Mkts crash over weak rupee, global cues. The bears further tightened grip over the markets as bulls run for cover. Markets closed with losses for the 6th straight session as late sell-off hits the trade. Meanwhile, rupee hit a fresh 2-year low in the intra-day as investors are worried over China economic growth. Mumbai: The bears further tightened grip over the markets as bulls run for cover. Markets closed with losses for the 6th straight session as late sell-off hits the trade. Meanwhile, rupee hit a fresh 2-year low in the intra-day as investors are worried over China economic growth. Also weak monsoon forecast coupled with FIIs selling spree at higher levels weighed on the markets. 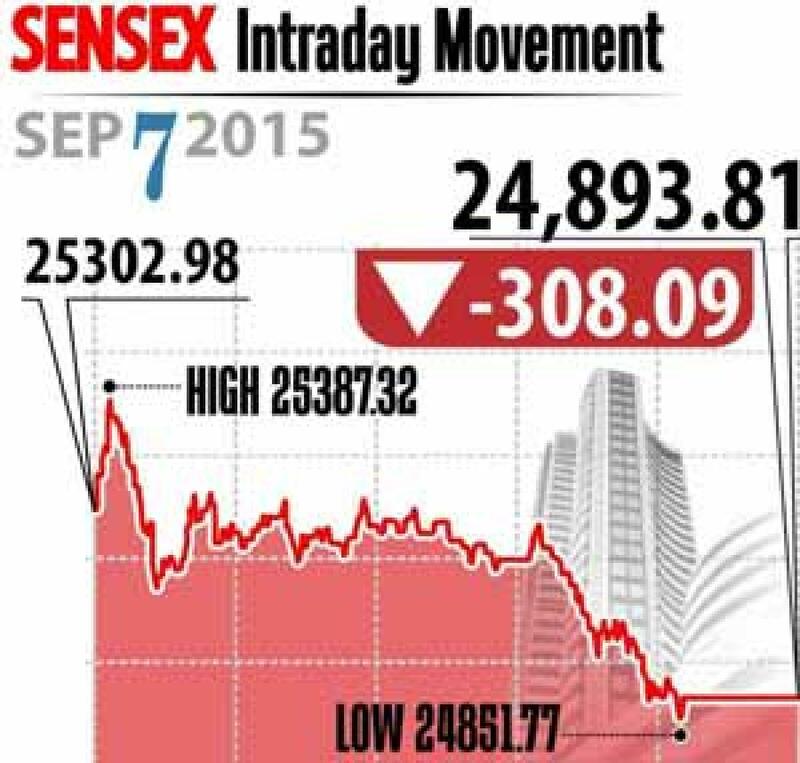 Sensex down by 308 points to close at 24,894 and Nifty fell 96 points to end at 7,559. The broader markets fell with midcap and smallcap indices lower up to 2.2 per cent. On the sectoral front, all sectors fell with metal and healthcare indices were top losers. Metals hit due to sluggish economic growth in China with Jindal Steel, NMDC, Vedanta, Hindalco, Coal India, Hindustan Zinc and Tata Steel down up to 4.2 per cent. From healthcare space, Lupin and Sun Pharma closed 2.7 per cent lower due to profit taking at higher levels, while Dr Reddy's Lab closed lower 2.8 per cent as the company decided to recall drugs - Amlodipine besylate and Atorvastatin calcium tabs - in the US market. Index heavyweights ITC down 1.6 per cent, Infosys fell 1.2 per cent and L&T declined 1.9 per cent. While Tata Motors fell flat with positive bias, ONGC however closed marginally higher as its overseas investment arm acquired stake in Russia's largest oil field. The gainers: HDFC, up 0.64 per cent at Rs 1,149.45, Tata Motors, up 0.23 per cent at Rs 323.60, ONGC, up 0.18 per cent at Rs 226 and Maruti Suzuki, up 0.07 per cent at Rs 4,072.05. The losers: Axis Bank, down 3.90 per cent at Rs 450.55; Vedanta, down 3.59 per cent at Rs 89.95, ICICI Bank, down 3.34 per cent at Rs 249.25, Hindalco Industries, down 3.05 per cent at Rs 71.60 and Lupin, down 2.96 per cent at Rs 1,804.20.